After much anticipation, I had the chance to see Lincoln this weekend. It was totally worth it! Like I said earlier this week, this is NOT a war movie with scenes of gore and violence (there is but one brief scene), nor is it an overt film about Lincoln’s specific relationships with any particular person. It’s a glimpse into Lincoln’s last four months of life, both public and private, covering his relationships on duty and off. You will walk out of the theater with a much better understanding of a national leader who had the burden of over a half million casualties of war under his watch. You will also appreciate how information was transmitted — there are many scenes in the War Department’s telegraph office. Should you bring your kids, considering the lack of war-scenes? My husband and I were glad we didn’t bring them. It’s rated PG-13, likely due to the language, but I think my sons, ages 10 and 7, would have been very bored. The dialogue is about very grown-up topics — lots of politics — and our sons aren’t ready to have to process that. This film is a work of art, thanks to screenwriter Tony Kushner ( Angels in America, Munich ), producers Steven Spielberg and Kathleen Kennedy, and Spielberg’s incredible artistic vision as director. I also need to give props here to composer John Williams, set direction by Jim Erickson, and costume design by Joanna Johnston. Of course, the billing of acting talent portraying Lincoln, Secretary of State William Seward, House of Representatives party leader Thaddeus Stevens, wife Mary Todd Lincoln, and son Robert Todd Lincoln contributed to its beauty. I’m not going to offer a full review of the film, but instead provide a top five list of things that caught my attention and made this movie absolutely worth seeing on the big screen. As far as I know, I haven’t offered any spoilers here, only things that have been covered historically in the first place. 1. The portrayal of Lincoln himself. 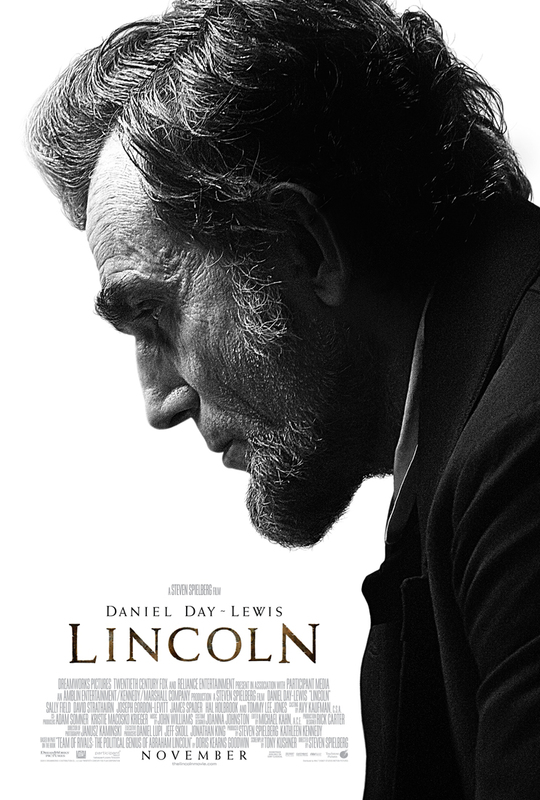 Obviously, Daniel Day-Lewis as Abraham Lincoln has generated plenty of buzz. He did an amazing job portraying not just the appearance (with help from the makeup team, of course), but he conquered the slouched posture, lurching stagger-of-a-walk, and pensive demeanor impeccably. My husband noticed that the makeup team captured the mole/raised bump just above Lincoln’s left side of his mouth, and one could tell that DDL worked hard at the higher-pitched voice that Lincoln was said to have had. Kudos to DDL for his command of the complicated dialogue – listen for his monologue about the legality of whether slaves should be regarded as war-bounty (i.e. property) and see for yourself. 2. The House of Representatives in 1865. Considering the design of the House of Representatives stems from the British House of Commons from only about 3 generations prior, you can catch of glimpse of the name calling, knocking over of chairs and other irreverent dialogue that took place back then. The battle for the 13th Amendment was particularly loud and wild, and the film captures this very effectively. The exchanges between Representatives Thaddeus Stevens and George Pendleton are particularly fun to listen to. 3. The actors chosen to portray Generals Lee and Grant. They have smaller roles in the film, but Christopher Boyer’s (Lee) and Jared Harris’ (Grant’s) likenesses and demeanors were uncanny. Take it from someone who’s seen every film adaptation of Michael and Jeff Shaara novels (and whose husband may or may not have filmed in some of those battle scenes), you won’t find the “Bad Beard Club” here! The makeup work was remarkable. 4. Seeing Abraham and Mary Todd Lincoln as parents. You get a glimpse of the day-to-day in the White House with the Lincoln family. You’ll see many similarities to modern times. Tad Lincoln wreaks havoc throughout the house similar to most other pre-teen boys, having been accused of burning the corner of a North Carolina war planning map, and having nightmares at night after looking at some disturbing images. I’m not even covering all of Tad’s antics! The older son, Robert, comes home from college and is constantly butting heads with his parents as he attempts to assert his adulthood. Mary grieves over a lost son (William), all the while not understanding how Abraham doesn’t show his grief the same way. Spielberg admitted in an October 60 Minutes interview that much of his inspiration for scenes such as these was due to his own relationship with his father. 5. S. Epatha Merkerson. Her part in this film is very small. The only other thing I will say is that you could hear a collective gasp in the audience of the theater I was in during her scene. Have you seen Lincoln? Let us know what you thought! ← The Pretty Peacock Jewelry Winner!